Can South Africa also draw with Mexico in the software development game? I was there – that’s me on the right with a group of Mexican football fans. As the long awaited FIFA 2010 World Cup tournament – the first in Africa – kicked off, I was sitting in the crowd of 85,000 at Soccer City in Johannesburg. 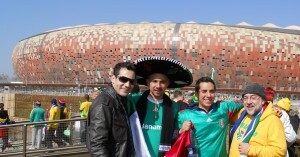 The opening match brought together Mexico and South Africa. Although my allegiance was obviously with my own Bafana Bafana team, I really enjoyed the bubbly enthusiasm of the thousands of Mexican fans at the stadium. As we got up to leave at the end of the match, relatively happy with the 1-1 draw, I was amazed that smiling Mexican fans came over to congratulate us and pose for pictures. Being at the South Africa vs. Mexico match had a particular significance to the Software Engineer in me. In 2008 I lead a delegation on a software engineering study tour to Mexico City. The purpose of the visit was to find out more about the Mexican software industry and to see what lessons we in South Africa could learn. One important insight was that while Mexico is richer and more populous than South Africa (it has a GDP three times larger, a population of over 100 million compared to South Africa’s ~48 million, and a gross national income (GNI) per capita of $14,000 compared to our $10,000), the two countries have software industries that are somewhat similar. Like South Africa, Mexico’s software industry has a challenge around finding enough skilled people. Both countries also have a mix of a handful of big companies developing software, and hundreds – or even thousands – of small companies. Unlike South Africa, Mexico has a very clear government-backed strategy for growing its software sector. Our delegation attended the launch of the “Prosoft 2.0” programme. This is a scheme that provides something like $80 million per annum in matching funding for companies working to improve their ability to produce high quality software. One of the initiatives supported by Prosoft is a national PSP (personal software process) and TSP (team software process) rollout. An important driver behind Prosoft is a strategy that aims to make “Mexico First” in terms of delivering the best quality software in the world. PSP/TSP is the methodology being adopted to achieve this. Our visit to Mexico was largely to understand more about the PSP/TSP programme. We were hugely impressed by what we saw. On our return from the visit I set about starting up a PSP/TSP pilot in South Africa with financial support from the Department of Trade and Industry (the dti). This pilot started in July 2009 and – I’m pleased to say – is already showing great potential. More about that in another blog posting – back to the World Cup and our match with Mexico. While the form-book says that Mexico should have hammered Bafana Bafana, we landed up acquitting ourselves wonderfully. The game was tough, but the result was fair. Thinking about the Prosoft slogan “Mexico First”, maybe we should be saying that we – the South African software industry – should at least aim to tie the game at producing the best quality software in the world. How things have changed since Geoff Hurst scored his 1966 hat-trick! It is very important to lobby goverment to support Proudly South African Software, they should at least back the SMME business in ICT industry. However do you think Mehico has what it takes to overtake India?.